The one downside to having so many different apps and integrations available is that it can sometimes be difficult to choose the ones that are best for your nonprofit. That's why we've compiled a list of the top Salesforce apps and integrations for nonprofits. With reviews of the top choices available for you to peruse, you can kickstart your research for the most effective CRM customization. You can read through this article or use the navigation above to learn more about the apps and integrations that look most interesting to you. We'll dive deeper into what each software tool does and why each of them made our list. Ready to get started? Let's dive in! Salsa Engage for Salesforce is a fully integrated suite of fundraising, marketing, and advocacy tools for nonprofits. This software makes it easy to collect information about your supporters in your CRM whenever they make a donation or participate in your advocacy campaigns. Bidirectional data integration. 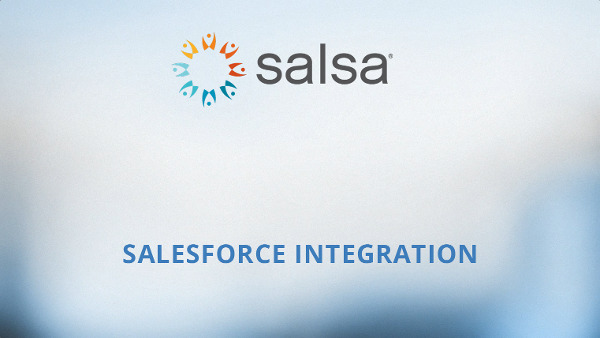 Salsa Engage for Salesforce will sync supporter information and activity with Salesforce and Salesforce will sync contact updates and other data with Salsa. This bidirectional integration provides easy data flow as well as easy segmentation and automation for marketing with Engage. Frequent synchronization. Data can be synced between the two platforms as frequently as every 5 minutes. Frequent synchronization keeps your organization up-to-date with almost real-time data and helps you make more precise decisions. User-friendly configuration. With many Salesforce apps for nonprofits, you'll find that you need to bring in consultants or tech experts to get the software up and running. With the user-friendly configuration on Salsa Engage for Salesforce, it's easy to set up the system to sync as frequently as you need it to. Match and merge duplication management. Salsa integrates with Salesforce's Duplicate Matching rule to identify matching profiles in the system. You can choose to automate the merging of these duplicate profiles or view them before merging. With Salsa Engage for Salesforce, you can leverage the complete customizable Salesforce platform in addition to the effective and robust fundraising tools that Salsa offers. Marketing automation tools. Save email templates and trigger email series to guide supporters toward making a donation or completing another important action using the contact information stored in your CRM. You can also trigger emails and social media posts to release at the same time as important nonprofit activities. Donation forms. Customize your donation forms with your nonprofit's brand colors, fonts, and logos. When supporters give to this page, their information is automatically streamlined into your Salesforce CRM to either create a new donor profile or update an existing one. Peer-to-peer fundraising pages. Peer-to-peer fundraising is a great way to market the brand of your nonprofit by spreading the word through the networks of your existing supporters. Meanwhile, your nonprofit collects important donations! Event registration pages. Event attendance is an incredibly important part of your nonprofit's engagement strategy. Integrating event registration pages with your Salesforce CRM makes it easy to streamline the data collected from event registrations into supporter profiles. Plus you can better organize your events. Targeted actions. Targeted actions are the perfect tools for advocacy campaigns. You can easily connect your supporters to their legislators and other community leaders to encourage them to make changes to policy processes in support of your cause. With all of these software solutions available in a single solution, your nonprofit will have the complete software toolkit that you need to develop your relationships with supporters. Our favorite part about Salsa Engage for Salesforce is the fact that all of the fundraising, marketing, and advocacy tools integrate with one another. When you purchase one-off Salesforce apps to solve individual needs for your organization, the integration usually only connects those apps to Salesforce. However, with Salsa Engage for Salesforce, all of the different tools work together to form a complete toolbox for your nonprofit. If your nonprofit is already using Salesforce, it's likely that you already have access to the Nonprofit Success Pack, or NPSP. This Salesforce app for nonprofits is used frequently to help organizations get started using the CRM. The pre-set configurations and core functionality transform the core Salesforce CRM into a complete nonprofit platform. The NPSP is extremely useful to help nonprofits adjust to Salesforce and realize the functionality of the CRM. The only limitation to the NPSP is that nonprofits easily grow out of the pre-set configurations, requiring more functionality. Many other apps integrate with this pack, so when you decide to expand, look for other Salesforce apps and integrations that will integrate with the CRM and this app. Supporter profiles. Your nonprofit invested in Salesforce to better track your donors and supporters. The NPSP provides tools to create profiles for your nonprofit's donors, volunteers, sponsors, and other supporters. Campaign management. Manage your programs, donations, volunteers, and pledges in one location. Keep an eye on these campaigns and other metrics through pre-configured or adjusted dashboards and reports. Connections to other apps. You can expand the reach of the NPSP for your nonprofit by connecting it to other apps such as the Marketing Cloud and Pardot. This broadens the range of your software's overall functionality. This app is an inexpensive starting pack for your nonprofit. It's a great way to begin using your Salesforce investment. As an NPSP user, you have access to the Power of Us hub. This is a global group platform where nonprofits all over the world share best practices and tips to better manage nonprofit missions. Plus, you have access to free online learning opportunities through Trailhead. This way, you can improve your nonprofit by using your most powerful resource—people. DonorSearch's wealth and philanthropic databases are used by nonprofits everywhere to better boost major giving campaigns, marketing campaigns, and other campaigns in which they want to learn more about their supporters. With access to DonorSearch for Salesforce, you can use the DonorSearch database to learn more about each supporter as their data is streamlined into your CRM from lead captures or fundraising pages. For instance, you may want to learn more about other nonprofits the supporter has given to, what is an ideal major gift target ask, or what assets that supporter has access to. DonorSearch can tell you just about anything related to prospect research! Data imports. Import research results into DonorSearch fields to use crucial data in custom reports. One-click profile generation. Click the DonorSearch button on the Salesforce platform to access detailed supporter profiles and manually research each donor. Custom workflows. Customize workflows to help you review every donor as they enter your CRM automatically. Create tasks to continue research. These tasks can help you conduct further research, refine ratings, or take action. You can use the data DonorSearch provides to help enhance any of your nonprofit's fundraising campaigns and outreach. DonorSearch's industry-leading matching logic has helped it become one of the most accurate prospect research databases. With DonorSearch's Salesforce integration for nonprofits, you'll have access to over 20+ fields of data in any development report. Storage Helper's Salesforce app for nonprofits helps you save money on Salesforce data storage fees. Your nonprofit probably has old records saved in Salesforce that are no longer relevant. Storage Helper is designed to identify storage usage trends and automatically delete irrelevant information. Storage Helper not only helps you identify the opportunities for additional storage space, but it also automates mass deleting of records and archiving of data to save the time your nonprofit spends on saving space. Salesforce Tasks. Old, completed tasks in Salesforce can eat up a lot of data storage space. Plus, your nonprofit no longer needs access to the information housed in these tasks. Use Storage Helper to mass delete old tasks that no longer serve their original purpose. Automated emails. Nonprofits automate emails to supporters as a part of marketing drip streams and triggered responses. Storage Helper helps delete the automated emails your organization no longer needs based on your specified criteria. Inactive campaigns. If you're a part of an older nonprofit, and have been using Salesforce for a long time, you probably have old campaigns that are no longer of any use to your nonprofit. Deleting these inactive campaigns can save you valuable space. Our fear of deleting anything online leads to us overpaying for storage space. This Salesforce app for nonprofits will help you sort through old records to ensure you keep the important information but delete data you don't need anymore. Storage Helper is built by Passage Technology. When you purchase Storage Helper, you have the option to bundle it with two of their other Salesforce apps: Rollup Helper and Lookup Helper. Rollup Helper makes it easy for nonprofits to convert raw data into actionable charts and reports. Lookup Helper is designed to help organizations interested in account-based marketing to relate relevant information to key accounts. With all three of these Salesforce apps for nonprofits, your organization will have access to an entire data management system within your Salesforce CRM. DocuSign harnesses the power of technology to make signing agreements fast and easy. From contracts to registration waivers, DocuSign makes it easy to distribute agreements to the appropriate audience. Once signed, supporter information included on the agreement is streamlined into your Salesforce CRM, eliminating the costly human error that comes with manual reporting. It's natural for organizations to be skeptical about technology when it comes to something as important as agreements and waivers. However, the features offered by DocuSign should put these fears to rest. Rigorous security standards. The security of agreement information is crucial. That's why DocuSign offers some of the strongest data encryption technologies available and robust authentication options. Multiple language support. It's important that your agreements be accessible to various audiences. DocuSign supports the ability to sign documents in 43 different languages, detected through browser settings or configured by document senders. Agreement templates and tags. Saved templates and tags help your nonprofit manage your agreements and get them out the door even faster. You can even set reminders and receive notifications during each step of the signing process. After the document has been signed, it's stored automatically to a secure online network. Administrators and signers can access the document anywhere at anytime. The user experience of DocuSign is top notch. Signers have the ability to sign their document from anywhere on any device. Plus, if they forget to do so online ahead of time, they can simply sign the agreement in person. Available in the AppExchange, DocuSign makes it easy to use the data in Salesforce to segment agreement recipients as well as collect data submitted on the agreement itself. With so many possibilities for Salesforce apps and integrations, you can configure your CRM for all of the functionality your nonprofit needs. These apps and integrations are a great start, but there are hundreds more to choose from!